Augmented Reality is indeed an extremely useful invention that makes our life improved and enriched in so many ways. It has already been adopted by different sectors such as manufacturing, education, entertainment, tourism, healthcare, disaster management, engineering design and more. As a matter of fact its application is witnessed almost in every field including the field of firming i.e. agriculture. The agriculture system might seem a simple and straightforward thing on an apparent level – just sow the seeds and reap the harvest. But it is not as simple as that. On the contrary it involves a whole lot of knowledge, effort and scientific approach so as to say. The task gets even more difficult as the demands of crops are going up day by day to feed the ever increasing population. Thanks to the ever advancing development of science and technology which is empowering the agricultural system with a number of related products and tools to cope with the gaping demands. And among those scientific tools and weapons Augmented Reality is the newest addition. 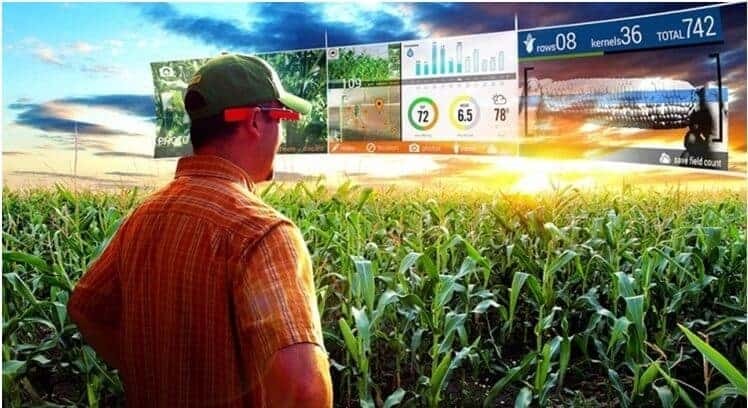 Augmented Reality can aid farmers in different ways. It can inspect the field and detect the presence of pests and insects in it. It is also capable of identifying the species of the insect and determining ways to handle it in proper manner. As a matter of fact all insects do not deserve similar treatment and they require different methods to manage them effectively. Moreover some of them are essential for the well being of the land and also for the eco-system. Therefore it is better off to let them as it is. An advanced agricultural AR system can sense all these differences and suggest right steps to be taken in each case. Thus it works as an efficient pest control management system to help farmers come up with improved and increased amount of harvest. The technology can be utilized to determine the quality of a land for farming purposes and what kind of crops will best flourish in it. In other words it will help setting up a reliable firming model to be used for a long time. This will help the farmer to facilitate improved farming both in terms of quality and quantity. Moreover as AR can provide several weather related information on a real time basis this ability can be well utilized when farmers are about to initiate a particular farming process that is dependent upon certain weather conditions. This could reduce much of their time and effort which often get wasted due to whimsical nature of weather. Truly speaking AR technology is quite new to the agriculture field and has not yet been utilized to the best of its abilities. However it has got immense possibilities to be applied in the said field in more varied and purposeful ways. And the days are not too far when AR will assume a powerful role to manage the entire agriculture system and address a number of issues related to this field. And in this way it will soon bring in a drastic change in the form and method of agriculture.